The Chestnut canoe company of Fredericton, New Brunswick, was a preeminent producer of wood and canvas canoes. Teddy Roosevelt purchased their canoes for his South American expedition. Before aluminum, fiberglass, ABS, Kevlar, and other synthetic materials, Chestnut used wood to make canoes for every purpose. Around 1954, they produced a green Prospector Garry, serial number CHN47317M75J, 8770HF. I don’t know all the waters that boat traveled, but somehow it wound up as a display item at Wilderness House, an outfitter on Commonwealth Avenue in Boston. Hanging from the rafters as a signature trophy was some kind of honor, I suppose. However, Prospectors were canoes made to be used–for work and expeditions. They had no keel, high gunwales, and wide ribs and other features to make them whitewater capable. They could carry a half ton of people and cargo. Unlike canoes made from most of the new materials, wood-and-canvas canoes are infinitely varied, beautiful, quiet, repairable, and sensual. Three decades after it was made, my friend Brian Smith called from Wilderness House. He said that WH had decided to sell the Prospector and that he was waiting in line to buy it for me. There was a clear assumption that I would come up with the cash. His action was simply to make sure I didn’t lose the opportunity, not a major gift. And Brian already had a Chestnut himself. So, shortly before Emily and Stephen were born I adopted a 30 year-old canoe. It’s an oxymoron today to say “whitewater, wood-and-canvas canoe.” But before the 1950s, wood-and-canvas was the material of choice. We took this particular canoe on some rough waters, including the Oxtongue River in Ontario, although to be honest, we didn’t run Ragged Falls. The canoe performed well in every setting, in salt water, ponds, and rivers; in wind and rain, carrying four people or one. But like everything it aged. There were some small dings from expeditions; the paint faded and peeled; the canvas sagged; some gunwales had separated; and two ribs broke, probably during our move to Massachusetts. It was time for a makeover, for what was now a 60 year-old canoe. Walter Baron, a neighbor and expert boat builder, agreed to take on the task. In the photos below you can see some steps in the process. Walter removed the canvas and stripped the inside. I asked him to add a beautiful new portage yoke I purchased from Essex Industries in New York. Essex is a sheltered workshop, which unfortunately is facing difficult times. It seems to be one of the success stories for that type of facility. Today, we took final delivery on the rejuvenated and now, brick red, Chestnut Prospector. I wanted to try it out, even in the cold, but the local ponds are covered in 14″ of ice. So it now hangs in our garage. much as it did at WH, but knowing that its true destiny is to be loaded with gear, carrying its passengers silently and safely wherever their adventure leads them. The Chestnut family started marketing canvas canoes in the late 1890′s in Fredericton, New Brunswick. The early Chestnut canoes were modeled after a canoe built by B. N. Morris, and indeed, these early canoes clearly show the influence of Morris canoes. . . The Chestnut factory burned down in December of 1921, and was quickly rebuilt. Chestnut Canoe Company and Peterborough Canoe Company merged under the holding company Canadian Watercraft Limited. Canadian Canoe Company joined them in 1927. . . Chestnut shipped its last canoes in early 1979, then closed. Most of the Chestnut molds survive, and are being used in several wooden canoe shops in Canada. 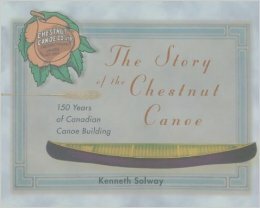 For more details about the history of the Chestnut Canoe Company, see Roger MacGregor’s book When the Chestnut was in Flower. via Chestnut Canoe Company.